Draft: 2013, Cincinnati Reds, CBAth rd. Was selected by the Reds with the fifth pick of the June 2013 draft's competitive balance Round A...was the team's second selection (behind OF Phillip Ervin) and the draft's 38th pick overall...in each of the 2016 and 2017 seasons was the club's nominee for the MLBPA's Marvin Miller Man of the Year Award, which goes to the player whose on-field performance and contributions to his community most inspire others to higher levels of achievement...in 2016 was the Reds' nominee for MLB's prestigious Roberto Clemente Award for his contributions on and off the field...wears uniform #21 in honor of Clemente...in 2014 was a Southern League All-Star...in 2018 received votes for but did not win the Louisville Slugger Silver Slugger Award for pitchers...was trying to become the first reliever ever to win the award...in 2018 became only the third Reds player whose primary position was pitcher to hit 4 HR in a season...hit 2 of his 4 HR as a pinch hitter...the single-season franchise record for home runs as a pitcher remains 4 by converted outfielder Hal Jeffcoat, who hit all 4 of his HR in 1957 while in the game as a pitcher...Tom Parrott hit 4 HR in 1894, including 2 as pitcher, 1 as a LF and 1 as a 2B...entered the 2019 championship season as a career .250 hitter with 6 HR and 18 RBI...in his career as a pinch hitter is 4-for-20 (.200, 3hr, 6rbi), with home runs on 4/6/17 off Phi's Adam Morgan, 6/24/18 off Chi's Mike Montgomery and 6/30/18 off Mil's Jacob Barnes (grand slam)...7 times in his career entered games as a pinch hitter and remained in that game to pitch...5 times in his career came off the bench to produce a home run, including twice as a reliever and 3 times as a pinch hitter...all other active Major League pitchers combine for just 2 such games. 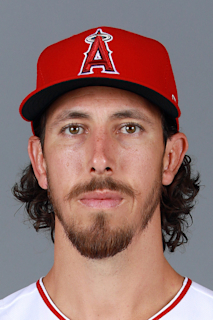 Graduated from Fullerton (CA) High School...pitched and played outfield at Cal State-Fullerton, where in 2013 he posted 19 saves in 22 apps as a pitcher (3-0, 1.99, 22.2ip, 17h, 4bb, 20k) and in 59 apps as an outfielder hit .335 (7hr, 53rbi, 12sb)...with 35 career saves established a school record...following the 2013 collegiate season was 1 of 5 finalists for the National Collegiate Baseball Writers' Association Stopper of the Year Award, 1 of 12 players named to the John Olerud Two-Way Player of the Year Award watch list, a Golden Spikes Award semifinalist, a Louisville Slugger first-team All-America selection and All-Big West Conference for the second straight season...follow on Twitter at @Lorenzen55. Made his first 42 apps of the season in relief (3-1-1, 3.21, 67.1ip) and his last 3 apps as a starter (1-1, 2.63, 13.2ip)...the Reds went 2-1 in his 3 starts...his 3-1 win on 9/18 at Mil was his first start since 2015, when during that rookie season he made 21 starts and 6 relief apps...between starts on 9/16/15 at SF and 9/18/18 at Mil, made 151 consecutive apps in relief (13-6, 3.60)...while pitching out of the bullpen made 20 apps of more than 1.0 inning and 15 apps of at least 2.0 innings, including apps of 3.0 innings 3 times, 4.0 innings twice and a career-high 4.1 innings in relief on 8/14 vs Cle...in the 7-2 win on 6/1 at SD threw 4.0 innings in relief of starter Tyler Mahle to earn his only save of the season and third of his career...was the longest relief appearance of his career to that point and the first 4-inning save by a Reds pitcher since Elmer Dessens threw the last 4.0 innings of Ron Villone's 11-5 win vs SD on 6/24/2000 at Cinergy Field...entered the 8-1 loss on 8/14 vs Cle in the second inning in relief of starter Sal Romano and threw 4.1 innings, a new career high out of the bullpen and tied for the longest relief outing by a Reds reliever in 2018 (Keury Mella, 8/2 at Wsh)...8 times pitched consecutive days...never in his career has pitched on 3 straight days...fell short in his bid to become the first relief pitcher ever to win a Silver Slugger Award...among all batters whose primary position was pitcher, led the Major Leagues in HR (4), RBI (10) and slugging percentage (.710) while ranking second in batting average (.290) and third in on-base percentage (.333)...before joining the rotation for his last 3 apps, was trying to become the first player in the live ball era to produce at least 4 HR in a season without starting a game...hit 2 of his 4 HR as a pitcher and his other 2 HR as a pinch-hitter...on 6/30 off Mil's Jacob Barnes became the first pitcher to hit a pinch-hit grand slam since Tommy Byrne of the White Sox did it on 5/16/1953 at Yankee Stadium...as a pinch hitter went 3-for-13 (2hr, 5rbi), with home runs on 6/24 off Chi's Mike Montgomery and 6/30 off Mil's Jacob Barnes (grand slam)...over 5 consecutive plate apps from 6/7-6/30, he singled, homered (pinch hit), walked, homered and homered (pinch-hit grand slam)...became the first Major League pitcher to homer in 3 consecutive at bats since Col's Mike Hampton in 2001...from 6/24-6/30, homered in 3 straight at bats over 4 apps (HR, walk, HR, HR)...on 6/7 vs Col pinch hit and produced a 116.5-mile-per-hour single off Tyler Anderson, the hardest-hit ball in the Statcast era by any Reds batter or by any Major League pitcher...in the top of the ninth inning of the 10-3 loss on 8/13 vs Cle played right field, his only Major League appearance at a defensive position other than pitcher, and singled...from 3/29-5/22 was on the 10-day disabled list with a right shoulder strain, including a 3-game rehab stint for Pensacola from 5/14-5/20...in spring training made 4 apps before he suffered a right shoulder strain...was disabled on Opening Day...didn't make his season debut until 5/23 vs Pit. Led the pitching staff with 8 wins and 70 apps, both career highs...ranked T5th in the National League in wild pitches (12) and 15th in apps...posted a 2.93 ERA prior to the All-Star break (37g) and a 6.32 ERA during the season's second half (33g)...earned his first 2 Major League saves, in the 7-5 win on 4/15 vs Mil and in the 5-2 win on 9/17 vs Pit...in 20 of his 70 apps threw more than 1.0 inning...twice threw a season-high 3.0 innings (4/10 at Pit, 5/30 at Tor), once threw 2.1 innings (7/28 at Mia) and 9 more times threw 2.0 innings...10 times pitched on consecutive days...never in his career has pitched 3 straight days...inherited the bases loaded 4 times, a staff high, and stranded 11 of the 12 runners...in the 7-1 win on 4/10 at Pit combined with Cody Reed (3ip) and Wandy Peralta (1ip) to throw 7.0 perfect innings...Reds relievers threw 7.0 hitless innings in a game for the first time in modern franchise history...in his first appearance of the second half (7/15 vs Wsh) allowed 6 earned runs, his career high out of the bullpen, while recording just 1 out...following that outing, his season ERA rose from 2.93 to 4.08 and didn't drop below 3.78 (7/22) the rest of the season...from 7/23-8/4 allowed at least 1 run in a career-high 5 consecutive relief apps (7ip, 11h, 6r, 5er, 2bb, 8k, 1hr)...3 times was used as a pinch hitter, on 4/6 vs Phi (HR off Adam Morgan), 4/16 vs Mil (6-3 off Wily Peralta) and 6/6 vs StL (1-3 off John Gant)...iIn the sixth inning of the 7-4 win 4/6 vs Phi produced a pinch-hit HR off Adam Morgan that snapped the 4-4 tie...was the first pinch-hit HR by any Major League pitcher since Cin's Micah Owings homered off StL's Ryan Franklin on 5/10/09 and the first pinch-hit HR by any Reds batter since Adam Duvall on 8/31/15 off Chi's Justin Grimm...was the club's nominee for the MLBPA's Marvin Miller Award, which goes to the player whose on-field performance and contributions to his community most inspire others to higher levels of achievement...retired the first batter in 50 of his 70 relief apps...stranded 19 of his 29 inherited baserunners...converted 2 saves in 8 chances...the Reds went 36-34 in games in which he pitched. In his first full season as a reliever posted a 2.88 ERA over 35 apps...in 12 of his 35 apps threw at least 2.0 innings, with a career-high of 3.0 innings in relief on 6/30 at Wsh, and 15 times threw more than 1.0 inning...the day before Opening Day went on the disabled list with a sprained right elbow that limited him to 1 spring training appearance...didn't make his season debut for the Reds until 6/24 vs SD...his father, Clif Lorenzen, died on 8/17...2 days later came off the bereavement list, threw 1.2 scoreless innings in that night's 9-2 win vs LAD and also hit his first career home run (3-run off Pedro Baez)...was the only home run by a Reds pitcher all season...his 3-run HR off Pedro Baez was the first by a Reds relief pitcher since Micah Owings homered on 5/7/10 vs Cubs off Carlos Silva...was the Reds' nominee for Major League Baseball's prestigious Roberto Clemente Award for his contributions on and off the field...MLB and the Players' Association donated $7,500 to the Dragonfly Foundation in Michael's name...also was the club's nominee for the MLBPA's Marvin Miller Man of the Year Award. In his Major League debut made 21 starts and 6 relief apps...was 1 of 9 rookie pitchers who combined for 110 starts for the Reds, both single-season modern club records... the Reds' season-ending streak of 64 consecutive starts by rookies, beginning 7/29, is a modern Major League record...was 1 of 5 Reds pitchers to start in his Major League debut (Raisel Iglesias, John Lamb, Jon Moscot, Josh Smith)...among National League rookie pitching leaders ranked 10th in ERA, T5th in starts, seventh in innings pitched and strikeouts and 10th in opponents' BA (.292)...made his first 3 apps of the season for the Reds as a starter (1-1, 2.81), followed by relief apps on 5/15 and 5/20...from 5/26-9/16 made 18 consecutive apps as a starter (3-8, 5.92) and then beginning 9/24 finished the season with 4 relief apps (4.2ip,1 er)...posted 7 quality starts...began the season at Louisville (3gs, 2-1, 2.84)...was promoted on 4/29 and in that night's 8-3 loss started vs the Brewers in his Major League debut after just 49 minor league apps...on 8/13 returned to the Bats for 3 minor league starts and went 2-1, 1.13 before he was promoted again on 8/31...following a 5-3 loss at SF on 9/16, returned to the bullpen after going 1-1, 6.00 in 4 starts following that 8/31 promotion...in his big league debut on 4/29 vs Mil, his first strikeout victim was pitcher Matt Garza... with 2 outs in the bottom of the second inning singled off Garza to become the first Reds pitcher with a hit in his first career plate appearance since Jose Arredondo on 7/29/11 vs SF...in his second start, a 7-1 win at Pit on 5/5, earned his first Major League victory...went 1-1, 2.81 in his 3 starts before a relief appearance vs SF on 5/15...in the fifth inning of that 10-2 loss to the Giants, grounded out as a pinch hitter and then pitched the sixth and seventh innings...excluding non-pitchers, became the first player to pinch hit and pitch in the same game since SF's David Huff on 5/26/14 vs Cubs and the first Red to do it since Micah Owings on 6/15/2010 vs LAD...on 6/6 vs SD produced his first career 2-hit game, both singles off Andrew Cashner...in spring training went 3-0, 1.80 in 2 starts and 4 relief apps (15ip, 12h, 10bb, 9k)...was a non-roster invitee to Major League spring training camp...as one of the final roster moves prior to Opening Day was reassigned to minor league camp the day the team left Goodyear. In his first professional season pitched at 4 different levels and in 1 start and 21 relief apps combined to post a 3.00era and 4 saves...following the season pitched for Glendale in the prestigious Arizona Fall League (6gs, 0-3, 11.42, 17.1ip, 29h, 12bb, 5k)...participated in the AFL's Fall Stars Game. May 23, 2018 Cincinnati Reds activated RHP Michael Lorenzen from the 10-day injured list. May 14, 2018 Cincinnati Reds sent RHP Michael Lorenzen on a rehab assignment to Pensacola Blue Wahoos. March 29, 2018 Cincinnati Reds placed RHP Michael Lorenzen on the 10-day disabled list. Right shoulder strain. August 19, 2016 Cincinnati Reds activated RHP Michael Lorenzen from the bereavement list. August 16, 2016 Cincinnati Reds placed RHP Michael Lorenzen on the bereavement list. June 22, 2016 Cincinnati Reds activated RHP Michael Lorenzen from the 60-day disabled list. June 13, 2016 Cincinnati Reds sent RHP Michael Lorenzen on a rehab assignment to Louisville Bats. August 31, 2015 Cincinnati Reds recalled RHP Michael Lorenzen from Louisville Bats. August 14, 2015 Cincinnati Reds optioned RHP Michael Lorenzen to Louisville Bats. April 29, 2015 Cincinnati Reds selected the contract of Michael Lorenzen from Louisville Bats. April 7, 2015 RHP Michael Lorenzen assigned to Louisville Bats from Pensacola Blue Wahoos. January 12, 2015 Cincinnati Reds invited non-roster RHP Michael Lorenzen to spring training. July 16, 2014 Pensacola Blue Wahoos activated RHP Michael Lorenzen from the temporarily inactive list. July 6, 2014 Pensacola Blue Wahoos placed RHP Michael Lorenzen on the temporarily inactive list. January 29, 2014 Cincinnati Reds invited non-roster RHP Michael Lorenzen to spring training. August 16, 2013 RHP Michael Lorenzen assigned to Pensacola Blue Wahoos from Bakersfield Blaze. August 1, 2013 Michael Lorenzen assigned to Bakersfield Blaze from Dayton Dragons. June 21, 2013 Michael Lorenzen assigned to AZL Reds. June 20, 2013 Cincinnati Reds signed RHP Michael Lorenzen.